Bingo Ball Necklaces – A must have for any BINGO enthusiast! These Bingo Ball Necklaces are a perfect gift for anyone who plays the game. 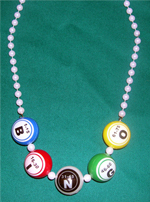 Our Bingo Ball Necklaces have five colored Bingo Balls to spell BINGO, and they measure 19-1/2" long. Order your Bingo Ball Necklace today through our secure on-line store. For a FREE 104 page gaming catalog, use our secure on-line Catalog Request Form or call us at 1-800-233-0282.